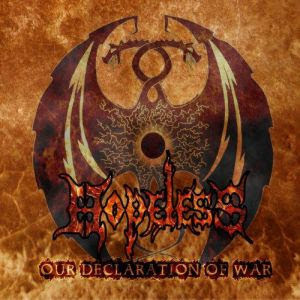 HOPELESS is an Italian combo that was formed in 2012 and three years later felt ready and decided to release their debut EP bearing the title “Our Declaration of War”. Musically, this trio delivers what we can identify as melodic death metal but since this genre has a broad spectrum and is enriched with different elements, this term alone isn’t enough. So, if I wanted to be more precise I’d say that the foundation of their music is melodic death metal but upon it they build and add plenty of grooves and some really nice intricate solos that offer more depth and variety to the end result. The rhythm section is solid and concrete, other times being fast and other times more mid paced and slow, while the vocals are either guttural or have a more high pitched screaming hue. Both, though, are great and are tied together perfectly with the grooves and the rhythm section. Lyric-wise now the band deals with serious topics spanning from environmental disaster to society and religion. All in all, “Our Declaration of War” is a really cool and interesting piece of music that shows a talented band that has potential. The fans of death metal should give them a try, cause they might find something interesting here! Αναρτήθηκε από Nick Parastatidis στις 5:30 μ.μ.